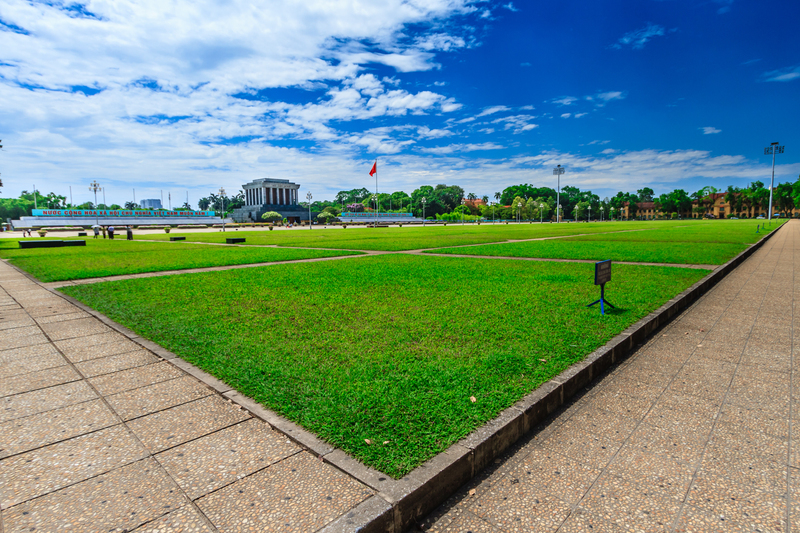 The square adjacent to the Ho Chi Minh complex is called Ba Dinh square, where many important national historical events in modern history took place. Located to the west of Hanoi's old city gates, until the early 20th century, Ba Dinh Square was a space with abandoned grounds, and newly-levelled ponds. The French had built a garden here named Puginier Round Point, also known as Round Square or Puginier flower garden (Puginier was the name of a priest). Some office buildings and villas surrounded the Puginier flower garden. One of the earliest constructed buildings was the Governor's Palace, built in 1902, which later was renamed the Presidential Palace. Other important projects constructed, included the Albert Sarraut school in 1919 and Party Central Committee agencies and the Department of Finance in 1925 (now the Ministry of Foreign Affairs Headquarters). After the successful August Revolution, President Ho Chi Minh read the Declaration of Independence, proclaiming the birth of the Democratic Republic of Vietnam, now known as the Socialist Republic of Vietnam, at Ba Dinh Square. That speech made headlines around the world. Representatives from all social sectors, including workers, youth, educators, soldiers, cheered over the country’s unity and independence is that historical moments. However, the square was not named Ba Dinh Square on September 2 1945. The name “Ba Dinh flower garden” was actually named in lieu of the old name “Rond Point Puginier” by doctor Tran Van Lai who was Hanoi Mayor under the then Tran Trong Kim Administration. Just in a short term from July 20 to August 19, 1945 when the administration belonged to the people's hands, Mayor Tran Van Lai renamed a lot of places and streets of Hanoi from French names to the names of national heroes and celebrities. The name “Ba Dinh” was given to commemorate the uprising against France of Dinh Cong Trang insurgents in Ba Dinh area of Nga Son District, Thanh Hoa Province (1886-1887). Many venue choices were made for a grand meeting on September 2, 1945 but finally Ba Dinh garden was selected, becoming Ba Dinh Square now. About 24 years later, the square also hosted the funeral of Ho Chi Minh. It was the same crowd who mourned and cried in the rain to send off their revere leader. It was then decided by in-power Vietnamese government that Ho Chi Minh Mausoleum be built on the square so that the national hero can be forever remembered. Ba Dinh Square was later called Independence Square. While France temporarily occupied Hanoi (1947-1954), the French Governor’s Palace was renamed Hong Bang Garden. In 1954, the Vietnamese army took over the capital and the name Ba Dinh Square was restored. In the proximity of the square, the Governor’s Palace became the Presidential Palace. Afterwards, there were many opinions on renaming Ba Dinh Square to Independence Square or September 2 Square to show closer links to the event on the birth of the Democratic Republic of Vietnam. But President Ho Chi Minh City kept the name “Ba Dinh” because of its historical and universal significance. After 1954, a series of additional projects were built around Ba Dinh Square, featuring old colonial architectures. They included Ba Dinh Hall (completed in 1963), Ho Chi Minh Mausoleum (1975), Ho Chi Minh Museum (1990), Monument to heroic martyrs (1994). Additionally, Ba Dinh Square’s architectural complex also had a number of smaller projects such as One Pillar Pagoda and Uncle Ho's stilt house area in the Presidential Palace. 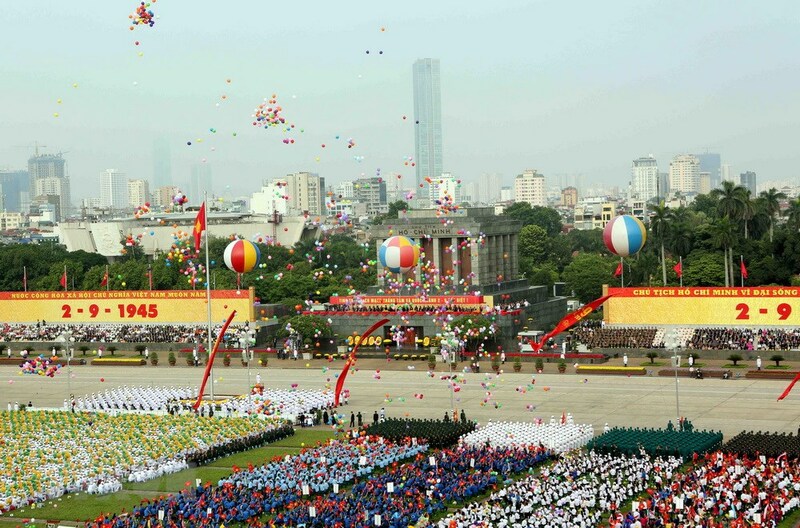 Ba Dinh Square witnessed the nation’s historical events associated with Autumn: Autumn of the 1945 Revolution, Autumn back to Hanoi in 1954; and 1969 Autumn at Ba Dinh Hall where the Vietnamese people and international friends mourned over the passing of late President Ho Chi Minh. Ba Dinh became a sacred land imprinted with unforgettable historical and spiritual architectures like Ho Chi Minh Mausoleum, the Monument to the Fallen Soldiers and Thang Long Imperial Citadel. Nowadays, Ba Dinh square is one of the few green and unoccupied areas of urban Hanoi. Many important events such as parades and commemoration of veterans take place at the square. Interestingly, despite its solemnity during the day, during the night time, the square is a popular gathering place for the local: families who want a walk, elderly who want to exercise and friends who want to hang out. A visit to Ba Dinh Square can be combined as a day or half-day trip to Ho Chi Minh Mausoleum, Ho Chi Minh Museum and One-pillar Pagoda.